The relationship between asthma and a tomato might not seem obvious at first, but dig deeper and the connection reveals an inextricable link between our health and that of the environment and community. Our industrialized global food system, long reliant on the overuse of finite natural resources, stresses the ecosystem beyond capacity which in turn stresses our bodies, our communities, and our economy. The idyllic representation of farms features diverse rows of vegetables and animals grazing freely on the nutrition growing in the soil beneath them. The family farms feed the people in nearby communities. However, these farms now represent at most three percent of the food in the U.S. food system. In reality, large farms with single crops, primarily corn for feed, soybeans, and wheat cover the middle of our country. These farms use intensive amounts of water and fossil-fuel based chemicals. They deplete soils of nutrients needed to grow healthy food. Confined animal systems command high doses of antibiotics and growth hormones and overfill waste containers. The drugs harm human and animal welfare. The runoff causes pollution. Food travels around the globe instead of around the corner leaving a trail of greenhouse gas emissions along the way. On the current trajectory human health implications due to environmental degradation will only accelerate in the future. The Fourth National Climate Report explains how rising water and air temperatures lead to waterborne and foodborne diseases, spread the geographic range of disease-carrying insects, and increase wildfire and ground-level ozone pollution that lead to allergic illnesses. Health Care Without Harm’s Healthy Food in Health Care program describes a holistic definition of healthy food which extends beyond the nutritional quality of food to include conserving and renewing natural resources, advancing social justice and animal welfare, building community wealth, and fulfilling the food and nutrition needs of all eaters now and into the future. Fortunately, leaders of institutions are beginning to step up and into the roles of feeding healthy school food and healthy hospital food. More and more are cooking from scratch with locally grown ingredients, and with the help of Beyond Green Sustainable Food Partners they are saving money at the same time. At Kona Community Hospital the first two months of a new healthy food program resulted in a revenue increase of 13% and an expense decrease of 17%. The cafeteria staff at Kona Community Hospital visited local farms to make connections with area farmers and learn about the local food system. During the initial two months, they depleted their freezer of pre-cooked, processed foods and replaced them with raw, fresh ingredients including 82% fresh produce and 50% fresh meat. 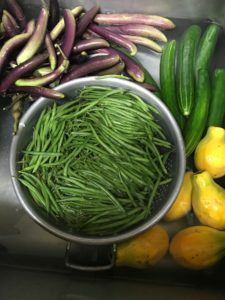 Nearly a third of the dollars were spent on local farms, addressing the issues of a complete definition of healthy hospital food and bringing sustainable hospital food to Kona Community Hospital. Additionally, they introduced 65 new plant-based vegan or vegetarian options to the menu. Diners now select from items such as tofu vegetable curry, black bean burgers, and BBQ jackfruit. Institutions such as Kona Community Hospital are rebuking the “do as I say not as I do” mentality. Instead of telling sick patients to go home and eat healthy, they are showing people the way to better health in their own food service program.